An adult tick has a life purpose of increasing the species through reproduction. These adult ticks need blood as their energy food source in order to mate and lay eggs for females to start the reproduction process. Summer is the prime season for ticks to feed on hosts. Adult ticks will attach on large hosts to feed and breed. The female tick feeds to gain strength for laying several thousands of eggs. While on the host, the male tick fertilizes the eggs. The female then drops to the ground to lay eggs and these must stay moist all the time. Tick eggs are the start of the tick life cycle; from eggs, larvae, nymphs and adult. 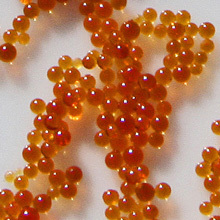 These eggs are usually reddish brown in color and are very small. Female ticks lay as many as 2,000 eggs to 18,000 eggs. Unfortunately, female ticks die after laying eggs, except for soft ticks. Soft ticks consume several small blood meals and lay eggs several times. When temperature and moisture are at suitable levels, the eggs hatch and the tick life cycle starts all over again. Hard ticks usually lay eggs in the protected areas on the ground during spring time. Brown dog ticks however lay eggs indoors. Ticks can transmit diseases and so it is crucial to eliminate the ticks and eggs to avoid the problems they bring. Tick eggs can be eliminated by putting salt all over the areas where ticks breed, like on carpets or sofa cushions. This will dry out the eggs. For climate with high humidity, it is suggested that the salt for two days; for dry climate, leave the salt for a week. After the suggested duration, vacuum the areas and empty the vacuum outside the house. Salt may also be rubbed on pets to naturally eliminate ticks.